French: Martin-pêcheur d'Amazonie; German: Amazonasfischer; Spanish: Martin Pescador Amazónico. 12 in (30 cm), 3.5-4.9 oz (98-140 g). 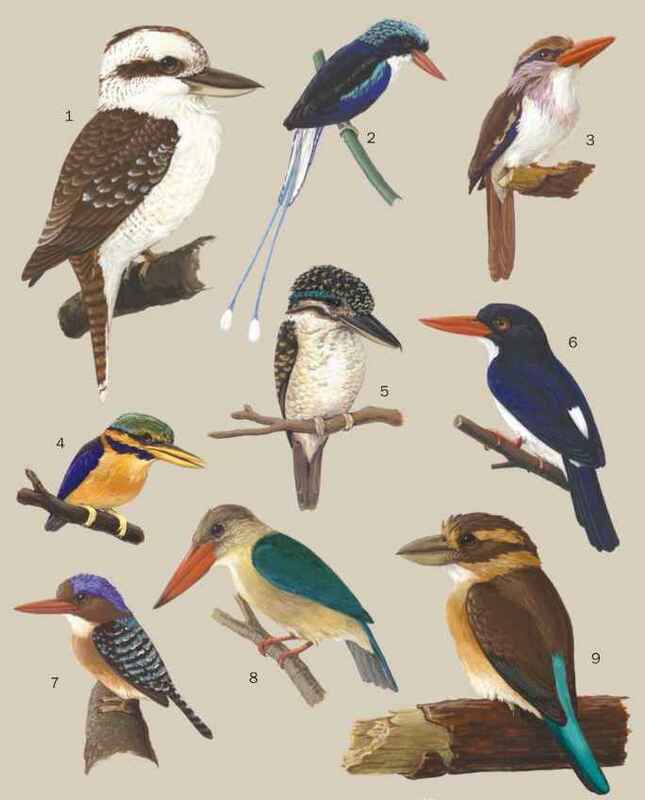 Very large, metallic-green kingfisher, with white underparts and collar. Flanks streaked with green, breast band rufous (male) or green (female). Long heavy black bill. 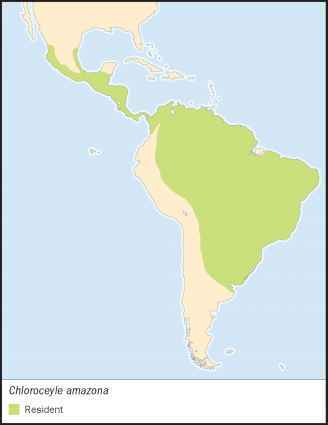 Mexico, central and South America, east of Andes and south to northern Argentina. Large rivers, lakes and estuaries, especially along more open shores, up to 8,202 ft (2,500 m) above sea level. Most often perched about 16 ft (5 m) up in large tree overlooking water. Sometimes bobs head or pumps tail. Utters loud harsh barks, singly or in rapid series. Aquatic diet, mainly of 0.4-6.7 in (10-170 mm) long fish, especially characid species, and some crustacea. Dives into water after prey from perch, rarely after hovering briefly. Both members of monogamous pair excavate nest tunnel in earth back near water. Lays two to four eggs, incubated for 22 days by female at night and mainly by male by day. Nestling period 29-30 days. Not threatened. Widespread and common, at densities of up to 1/km (large rivers), 4/km (streams) and even 5-6/km (lakes) at center of range. Occurs alongside four other species, two of similar size, two smaller, that may affect abundance, ecology, and success. French: Martin-pecheur d'Amérique; German: Gütelfischer; Spanish: Martin Gigante Norteamericano. 11-13 in (28-33 cm), 4.0-6.3 oz (113-178 g). Very large, blue-gray kingfisher, with white breast and collar. Breast band plain blue-gray (male) or with rufous below (female). Juveniles of both sexes resemble adult female. 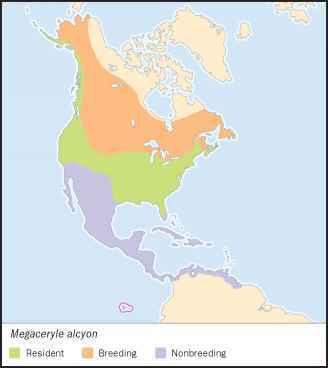 Resident across central United States of America and southern Canada, breeding summer migrant almost to Arctic Circle (to about 65°N), non-breeding winter migrant to southern USA and central America, south to Galapagos Islands and Guyana. Lakes, rivers, streams, ponds and estuaries, from seashore to 8,200 ft (2,500 m) above sea level. Uses mainly mangroves, coasts, and offshore islands during non-breeding season. Usually perched in large tree overlooking water. Main call a harsh series of rattling notes. Visually sensitive to near-ultraviolet wavelengths, but behavioral significance unknown. Aquatic diet, mainly fish, but also crustacea, amphibians, mol-lusks, and insects. Some fruit taken in winter. Hunts from perch or by hovering about 49 ft (15 m) above water, sometimes 0.6 mi (1 km) out from shore. Rarely submerges, catches most prey within 24 in (60 cm) of surface. Hunts mainly in late morning and afternoon, sometimes following egrets for any prey they disturb.